As a parent of a very special daughter with the potential for greatness, one would most assuredly provide her with guidance on how best to utilize her talents. If that daughter possessed magical abilities, the task of lighting her path would be even greater. 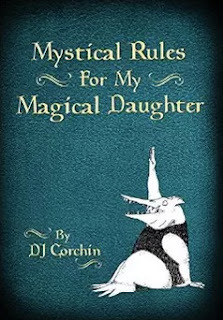 Mystical Rules for my Magical Daughter is a book written from the perspective of one such parent passing on generations of wisdom to a child who possesses the power to change the world, one person and one action at a time. This compilation of proverbs written as to a young girl who lives in a castle and encounters trolls and other mythical creatures, offers insight into living a magical and mystical life to the greatest of one's ability. Gems of wisdom hidden cleverly within wonderfully imaginative scenarios provide young girls with lessons which will help guide them throughout their life in the most magical of ways. Fanciful illustrations are utterly delightful and help tie together each wonderfully whimsical page of this book which is sure to be treasured by young girls who are blessed to receive this jewel of a book. Mystical Rules for my Magical Daughter, by DJ Corchin, is highly recommended and has earned the Children's Literary Classics Seal of Approval.